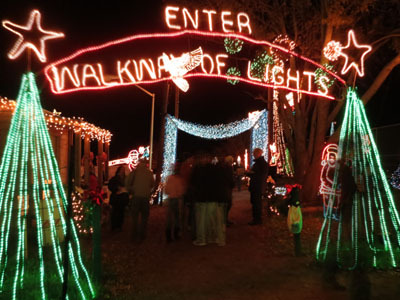 More than two million twinkling lights glimmer along paths beside the waters of Lake Marble Falls in a holiday spectacle called Walkway of Lights. It's a prime example of how a small community can provide big entertainment when hundreds of volunteers give time and talents. Admission is free to this annual holiday event, which seems go grow bigger and better every year. On our previous excursion to this winter wonderland we watched little children running around in amazement. Scenes like that are guaranteed to put a smile on any Scrooge’s face, lift your spirit, and put you in a merry holiday mood. 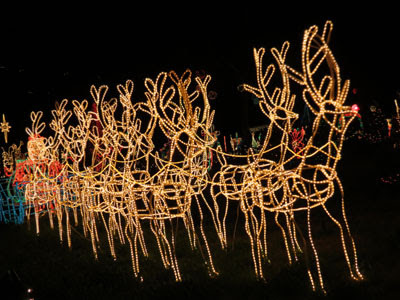 A full squad of reindeer pull Santa's sleigh. 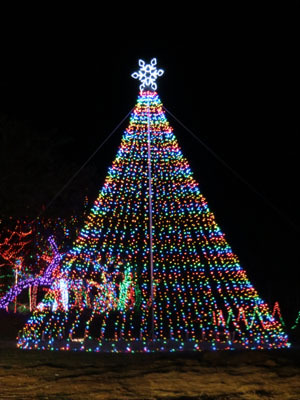 Rain cancelled the event for several nights in early December, but now it is an opportunity for a fun family outing to Marble Falls. Drive just 45 miles west of Austin on SH 281 or 85 miles north of San Antonio to see this community's gift to the public. Come early and shop historic Main Street. 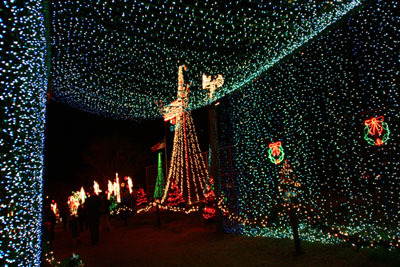 Then dine at the Blue Bonnet Café, River City Grille, or Russo's before heading to the Walkway of Lights after dark. important, even during the holidays. 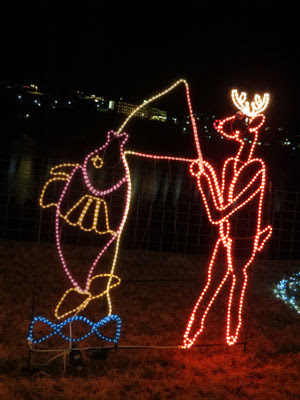 As you stroll leisurely along the Walkway enjoy hundreds of wire-frame sculptures twinkling in the night sky. Take time to notice the variety of attractions included here: a smorgasboard of whimsical, patriotic, religious, traditional, and contemporary forms. Ice skaters, Santa’s sleigh, Christmas trees, trains, stars, presents, a cross, and a menorah offer enchanting symbols of the season for everyone to savor. There’s even a water skiing Santa and fishing reindeer, a tribute to the lake location, and several American flags. Walk under the entrance arch and follow the path to Santa’s station or mosey through the blue-lighted tunnel, a favorite photo spot. at Marble Falls more spectacular. When other holiday light scenes in the Texas Hill Country closed several years ago, Marble Falls has ramped up its presentation. Each year many dedicated volunteers work hard to create, prepare, and set up the forms and then man the displays each evening. Santa himself shows up on certain nights to hear wishes whispered to the jolly man. Blue lights form a tunnel for visitors to walk thru. The illuminated display continues from 6-10 p.m. nightly through New Year’s Day. Donations are welcome because the presentation is completely funded by contributions. Santa photos help raise funds for local organizations. Workers at the entrance like to ask where you’re from as a way to keep track of visitors’ home regions. Past visitors have hailed from Canada, South America, Europe, and Asia. Read more travel stories at Striped Pot, a boutique travel e-zine written by a group of professional travel writers. Really amazing lights arrangement from Walkway of Lights. I went at River City Grille. Just recall that after reading entire blog.